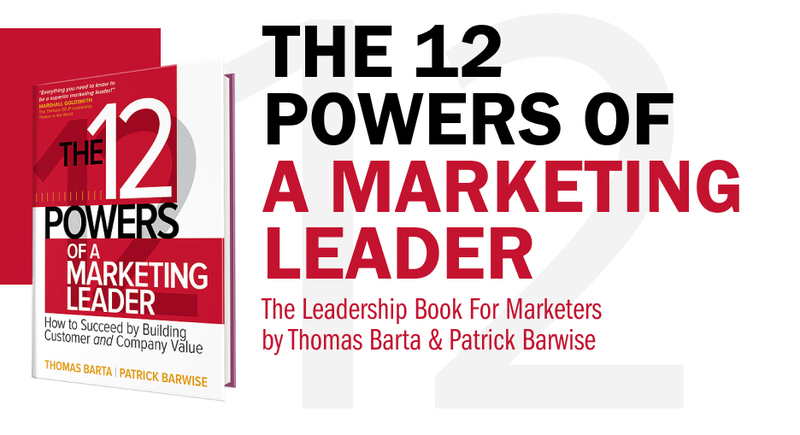 For this groundbreaking leadership book, former McKinsey partner and senior marketer Thomas Barta teamed up with London Business School marketing professor Patrick Barwise to answer the question: what makes an effective and successful marketing leader? Thomas and Patrick conducted the largest ever global study of marketing leadership, analyzing detailed original data on over 1,200 marketing leaders and more than 67,000 existing 360-degree assessments of both marketing and non-marketing business leaders. The research revealed 12 essential traits that can make or break marketers’ business impact and career success. MOBILIZE YOUR BOSS: Make an impact at the highest level and align marketing with the company’s priorities. MOBILIZE YOUR COLLEAGUES: Inspire and support your non-marketing colleagues to meet customers’ needs better than the competition. MOBILIZE YOUR TEAM: Build and hone a winning marketing team. Become a leader of leaders. MOBILIZE YOURSELF: Focus on goals that will benefit your customers, company, and long-term career. 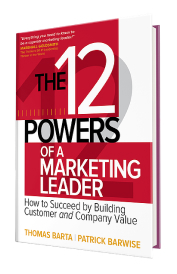 In The 12 Powers of a Marketing Leader, you will read firsthand accounts of marketing successes from around the world—and gain psychological insights that will surprise you into the leaders who drove the key decisions. You will learn how to persuade your colleagues, motivate your team, and strengthen your leadership skills. Warning: this isn’t a marketing book. It’s a leadership book for marketers, using the latest research on what works—and what does not work—in the digital age of marketing. By zeroing in on the value creation zone (“V-Zone”)—the all-important overlap between your company’s and customers’ needs—you’ll be able to help your business to win in the market and achieve your career goals. Remember: doing marketing isn’t the same as leading marketing. With The 12 Powers of a Marketing Leader, you can lead the way with a new vision that is powerful, transformative, and ultimately life-changing. 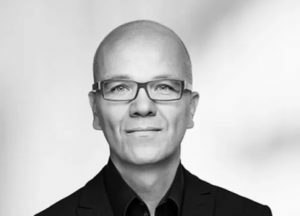 Thomas Barta is one of the world’s premier customer leadership experts.​ A former McKinsey partner, he studies the unique intersection of customer focus and leadership. Thomas has consulted and marketed for more than 20 years, in 14 industries, in 45 countries. His clients include many of the world’s most prominent organizations, including over two dozen from the Fortune 500. Thomas speaks to executives worldwide about how to break the silos and generate a true customer focus—in a global and digital world. His keynote speeches inspire people at countless company conferences, including events at Adobe, Google, IBM, and SAP. 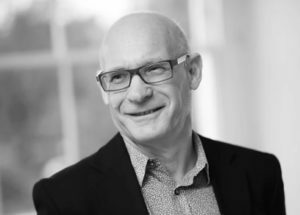 Patrick Barwise is Emeritus Professor of Management and Marketing at London Business School, former chairman of Which? (Europe’s largest consumer organization), a prize-winning author, and an expert on customer focus, innovation, and marketing. His book, Simply Better: Winning and Keeping Customers by Delivering What Matters Most, coauthored with Seán Meehan (IMD, Lausanne), has been translated into seven languages, and won the American Marketing Association’s annual Berry-AMA Book Prize. Order it here from AMAZON.COM. Barwise and Meehan’s second book, Beyond the Familiar: Long-Term Growth through Customer Focus and Innovation, was published in 2011. Order it here from AMAZON.COM. TAKE THE MARKETING LEADERSHIP QUIZ! How well do you know marketing leadership? Take the quiz! Read the questions below. You’ll find the answers by clicking on the questions. How many did you get right? What’s the biggest success factor for the Chief Marketing Officer (CMO)? A: The CMO’s leadership and functional skills matter more for success. Marketers are more powerful than many think. A large study of 1,232 senior marketers from 74 countries has proven that leadership and functional skills explain over 57% of the explicable variation in a CMO’s career success and 77% of his or her market success. External factors, such as budgets, aligned goals, company culture, role clarity, and top management support, matter less. Marketers can overcome many (but not all) of these external factors by displaying strong leadership and functional skills. How many CMOs believe they have great careers? B: The answer is 44%. Most senior marketers (71%) believe they create high market impact. But only 44% say they’ve found a formula to make their careers work. A: The power of marketing departments in U.S. organizations is rising. In a study of 612 publicly traded U.S. firms published in the Journal of Marketing, Feng et al. proved that the power of marketing departments in U.S. firms has steadily increased over a period of 16 years. For CMO career success, what matters most? B and E: Energizing others as a role model and possessing a vision for business and own life are equally important factors in the career success of senior marketers. In a large global research study, these two attributes each accounted for 13% of the explicable variation in career success. Other factors also mattered: knowing how to inspire others (12%), creating visible successes (12%), and focusing on big issues (10%), understanding the customers/products/markets (9%)*. *Six other attributes, not listed here, make up the remainder. For CMO business impact, what matters most? E: Marketing skills (self and team) matter most for the business impact of senior marketers. Functional marketing skills account for 20% of the explicable variation in market impact. To create market results, senior marketers must excel at their craft (“doing marketing”). Other leadership behaviors matter too: knowledge of customers/products/markets (18%), the ability toenergize others as a role model (13%), return orientation (11%), focus on big (business) issues(10%), and team performance management (6%)*. Rank in order of importance: How do CMOs see themselves? This list is a selection from more than 50 attributes described in the research. A: Firms with CMOs achieve a higher financial performance compared to firms without CMOs. A 2015 study using data from 155 publicly traded U.S. firms over a 12-year period showed that the financial performance of companies with CMOs was, on average, 15% higher compared to firms without CMOs (measured by Tobin-q). Germann et al. also make a strong case for the positive financial impact of having a CMO. How many senior marketers say, “Other people don’t understand marketing”? B: The right answer is 36%. In the CEO’s view, which departments are most involved in defining strategy? Source: Barta, T., Barwise, P., The 12 Powers of a Marketing Leader, 2016, N = 67,278 executive profiles. What defines a CMO most–as seen his/her team? D: Shows enthusiasm for projects scored highest when marketing team members were asked about their bosses (73 % fully agree). BONUS QUESTION: When the CEO fails to understand customer focus, what should the CMOs do? B: CMOs talk to a headhunter and find a new boss. In principle, external factors (e.g., top management support or budgets) are less important contributors to a CMO’s success. The CMO’s leadership ability and skills matter more. That said, top management support, among all external factors, has the biggest influence on CMO success, accounting for 41% of the explicable variation in marketers’ business impact and for 32% of career success. Poor top management support is the hardest factor to overcome. Advice to marketers: If the CEO really doesn’t understand the practicalities of customer focus, you’re on a road to nowhere and the company is probably doomed. Get out while you can. TAKE THE CUSTOMER LEADERSHIP PROFILE-TEST! Get your personal profile based on the world’s largest ever research and what makes an impactful customer leader.